If you intend to use any portion of this article in your training program, permission can be granted by writing the author. 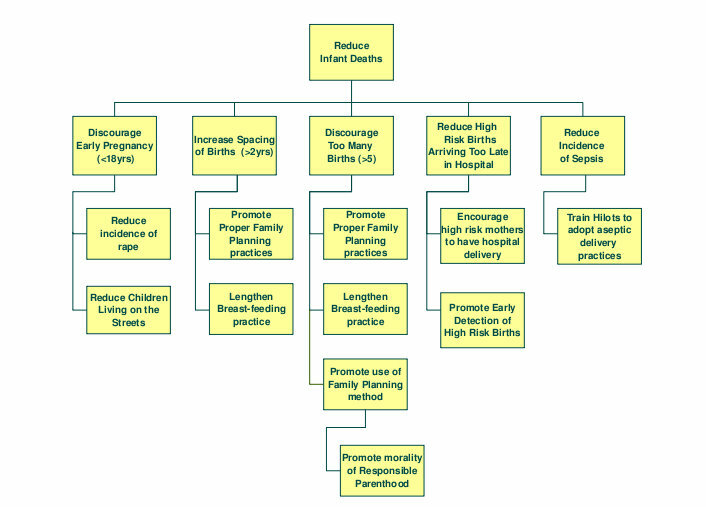 The illustration below of the objective tree is based on an objective formulation exercise undertaken by the author. It has been abridged by the author for teaching purposes. What is an Objective Tree? An objective tree is an objective formulation tool that depicts graphically the hierarchy of objectives. It is formulated by initially inverting the statements found in the problem tree. Afterwards, the inverted statements of the problem tree are rephrased to make the statements realistic and not improbable, and to remove absurdly stated inverted statements. The diagram is finalized by assessing the sufficiency of the interventions (objectives) identified and identifying new strategies (objectives) to meet the test of sufficiency. This tool is often used in tandem with the problem tree.